Nestled between the two redwood forests in a thriving dairy community, you may discover Northern California’s best-kept secret, The Victorian Village of Ferndale. Park your car to step back in time. Enjoy magnificently preserved Victorian architecture as you stroll; pick up visitor information from any shop. On the National Register of Historic Places, Ferndale’s Main Street is a photographer’s paradise and a shopper’s delight. Explore the old-fashioned mercantiles, antique stores, art galleries, and specialty shops, hear the ringing of the blacksmith’s hammer, and talk with the friendly people. Watch fresh candy being dipped by hand to whet your appetite for a fine dinner and an evening of theatre. 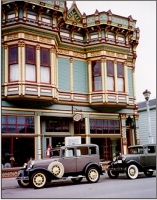 Just 5 miles from Ferndale’s Victorian Main Street lies California’s Lost Coast … worthy of your exploration!